Risk Modeling for Hazards and Disasters　covers all major aspects of catastrophe risk modeling, from hazards through to financial analysis. It explores relevant new science in risk modeling, indirect losses, assessment of impact and consequences to insurance losses, and current changes in risk modeling practice, along with case studies. It also provides further insight into the shortcomings of current models and examines model risk and ideas to diversify risk assessment. Risk Modeling for Hazards and Disasters instructs readers on how to assess, price and then hedge the losses from natural and manmade catastrophes. This book reviews current model development and science and explains recent changes in the catastrophe modeling space, including new initiatives covering uncertainty and big data in the assessment of risk for insurance pricing and portfolio management. 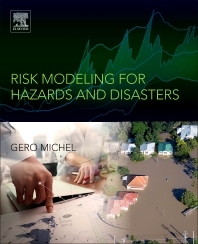 Edited by a leading expert in both hazards and risk, this book is authored by a global panel including major modeling vendors, modeling consulting firms, and well-known catastrophe modeling scientists. Risk Modeling for Hazards and Disasters　provides important insight into how models are used to price and manage risk. Gero Michel is the Managing Director of Chaucer Underwriting A/S in Copenhagen, where he is responsible for Chaucer’s European portfolio and capital market initiative. In addition Dr. Michel serves as an adjunct professor at Western University, London Ontario, Canada where he lectures on Insurance and Reinsurance as well as creation of catastrophe models. Gero Michel is co-founder of the Chaucer Risk and Research Center that links innovation and science to underwriting. Before this Gero was Senior Vice President, CRO and Head of Risk Analytics at Montpelier Re. Prior to joining the Montpelier Group, Dr. Michel was Managing Director of one of the largest joint venture between science and the financial industry, the Willis Research network, along with heading up model development at Willis in London. Prior to this, Dr. Michel lead international catastrophe underwriting at Endurance Specialty Holdings Ltd., in Bermuda; managed the windstorm and flood model development at Risk Management Solutions, Inc. and was a senior actuarial analyst at Hannover Re. Dr. Michel has a PhD and masters in geo-science, and has a senior level education from Harvard Business School. He has been an invited lecturer at numerous insurance and science events and has published various risk and insurance articles. He has over 30 years of experience in risk management and risk modeling.